Home > Lighting > Candle Holders > COMING SOON! 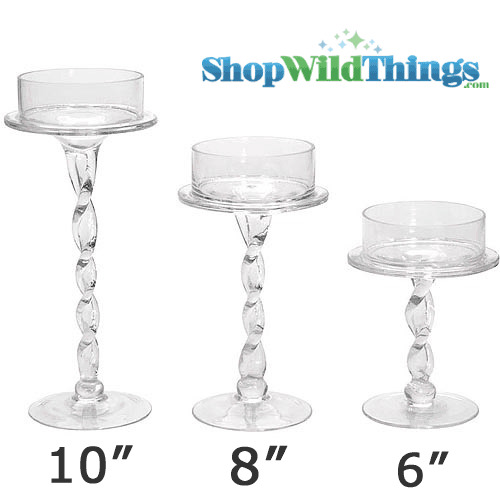 Candle Holder, Glass, Twisted Stand, 10"
COMING SOON! Candle Holder, Glass, Twisted Stand, 10"
Our new glass candle holder is so unique and is sure to add a touch of class and style to your event decorations! The twisted stem makes this candle holder stand out like no other. The candle holder is 10" tall with a base diameter of 3.5" and it will hold up to a 3" diameter pillar candle. Add another dimension by embellishing the lip surrounding the candle cup with trimming or bling. Due to the nature of this genuine glass holder, slight imperfections may occur. You will not find a better deal than this! Merchant Response:Thank you so much for shopping with us. We love our customers and are very proud of the great people we have working to provide the best possible customer service. The product is beautiful and I could not be more pleased. I ordered two different sizes and one of the sizes received was incorrect. They immediately corrected the order with no hassle and I would recommend this company wholeheartedly. Bought many sets of the 10" & 8" candle candleholders to be used with battery operated pillar candles for wedding reception decor. They arrived quickly and very well packed. They are going to be beautiful on the tables & are exactly what I expected. This is a really good price if you need several candleholders for a special occasion. I will reuse them afterwards on my fireplace mantle. Also I needed to make a change to my order & found the customer service rep to be very pleasant & helpful. I would definitely purchase from this vendor again. ProsInteresting stem. Perfect for pillars. Nice height. Customer service. Quick delivery. Well packaged for shipping glass. We ordered these for decorating a wedding and hot glued 5 inch Styrofoam balls with silk flowers, they turned out beautiful ! When I ordered these I did not realize how many we needed at the time and was able to call customer service and they were wonderful ! It is so nice to have a company that you can call and talk to someone. 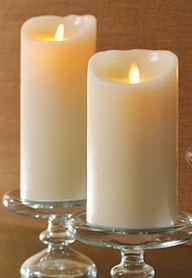 These candle holders are very pretty and provide the look I wanted. The only negative issue is the fact that the top rim of each piece is rather sharp, so be careful when you clean them. Great price!